WASHINGTON: Director US Defense Intelligence Agency (DIA) Lt Gen Robert P Ashley has said that Pakistan's counter-insurgency operations and border management efforts have reduced the menace of terrorism in the country. 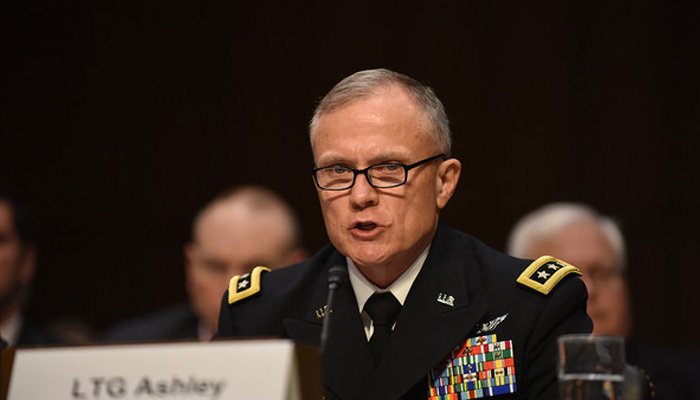 Lt Gen Robert P Ashley was addressing at the US Senate Armed Services Committee on the Worldwide Threat Assessment hearing at Capitol Hill on Wednesday. During his address, he highlighted Pakistan’s sincere efforts to tackle the menace of terrorism, Ashley added that Islamabad is likely to proceed with its counter-insurgency operations and border management efforts along its western border while sustaining counter-terrorism and paramilitary operations throughout the country. Recognizing Pakistan's sacrifices, Ashley said; "These efforts of Islamabad have had some success in reducing violence from militant, sectarian, terrorist, and separatist groups, but Pakistan will look to the United States and the Afghan government for support against anti-Pakistan fighters in Afghanistan." Despite all these efforts to contain militancy on its soil, Pakistan will look to the United States and the Afghan government for support against anti-Pakistan fighters in Afghanistan, the general deposed. Ashley also addressed a number of challenges and competitors the US faces, including North Korea, China, Russia, and Iran. On his assessment over South Asia, Gen Ashley stated: "Continued exchange of heavy fire between Indian and Pakistani forces along the Line of Control poses a risk of inadvertent or gradual escalation of hostilities.